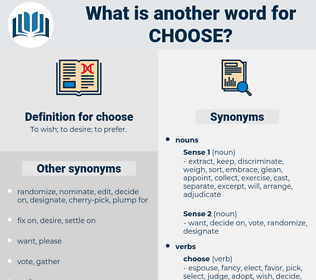 What is another word for choose? 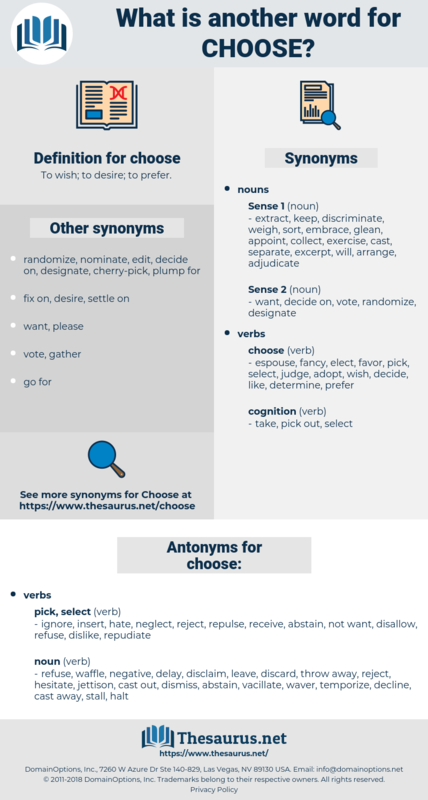 Choosing, chosen, Selecting, choices, chooses, choice. checked, nominated, appointed, identified, Screened, faced, Singled, sampled, drawn, marked, elected. decided, deciding, prefer, appoint, nominate, choice, embrace, pursue, carve. repudiate, disallow, ignore, dislike, neglect, repulse, hate, receive, not want, insert. refuse, waffle, negative, delay, disclaim, leave, discard, throw away, reject, hesitate, jettison, cast out, dismiss, abstain, vacillate, waver, temporize, decline, cast away, stall, halt. After that, we may choose to . single out, winnow, excerpt, panel, limit, empanel, pick over, field, screen, assign, plump, pick, take out, follow, set, specify, extract, nominate, sort, think of, espouse, skim off, fix, sift, vote, cream off, cull out, dial, anoint, impanel, vote in, propose, set apart, sieve, elect, screen out, go, sieve out, define, determine, adopt, draw. judge, determine, pass judgment, make up one's mind, evaluate, decide.